Entlebucher Sennenhund, also called the Entlebucher Mountain Dog or Entlebucher Cattle Dog, is the smallest of the group of four Swiss dogs that includes the Bernese Mountain Dog, Greater Swiss Mountain Dog, and Appenzeller. The Entlebucher Sennenhund breed was a herding dog and guardian for livestock, people, and farms. Entlebucher Sennenhund is medium-sized, standing 16 to 20 inches tall and weighing between 50 and 75 pounds. The muzzle is long, the eyes are dark and small, and the ears dropped. The tail is often a natural bobtail, but if it isn’t, it can be either docked or left long. The coat is short and hard and is a classic tricolor—primarily black with rust and white markings. The short coat does shed and should be brushed twice weekly except during heavy shedding, when a daily brushing will help control hair in the house. The Entlebucher Sennenhund is not overly active, although Entlebucher Sennenhund puppies can be quite rambunctious. Adults are normally calm in the house but will enjoy any activities you wish to pursue. They enjoy walks, a good run, training to pull a cart or wagon, and agility training. The breed does not tolerate hot, humid weather well. This breed is very wary of strangers, so early socialization is critical. Without adequate socialization, the dogs can become too reactive and will be overly watchful or fearfully shy. The Entlebucher Sennenhund breed was bred to work, so early training is important, too, to keep the mind busy. The training should be firm and structured, yet fun. 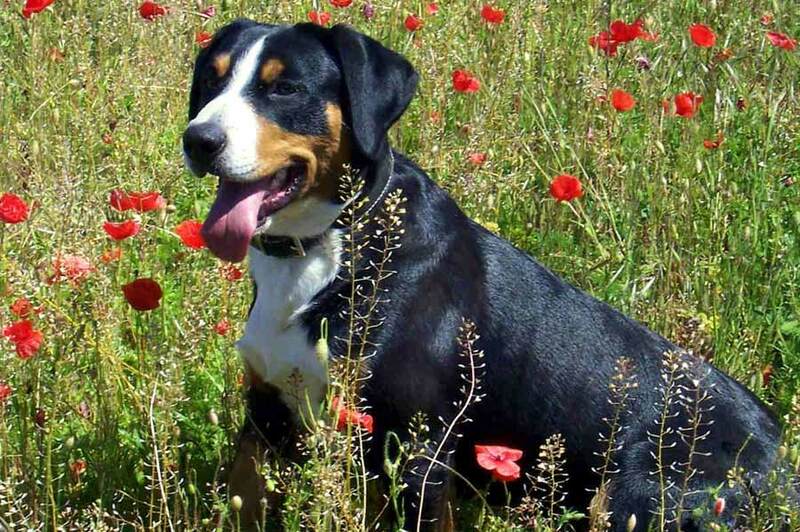 The Entlebucher Sennenhund needs an experienced owner who understands working and herding dogs. He needs a job to do and a purpose. He is friendly and loyal to family and friends but is watchful of his property and wary of strangers. He is great with children, although puppies can be rowdy and must learn the rules of good behavior around kids. When raised with them, he is very tolerant of other pets. Health concerns include eye problems and hip dysplasia. Share your Entlebucher Sennenhund story. Note: Upload only Entlebucher Sennenhund picture or your picture with Entlebucher Sennenhund below - spammer's ip may be blocked. The Entlebucher Mountain Dog makes a vigilant watchdog. He will sound off in a loud, deep voice to announce visitors — or simply to let you know that your neighbor has stepped outdoors. The Entlebucher learns quickly but can be dominant and pushy — necessary traits for working with unruly cattle, but challenging for nonassertive owners to handle. During adolescence, his hormones will kick in and he may start to test limits. Obedience training should start early.